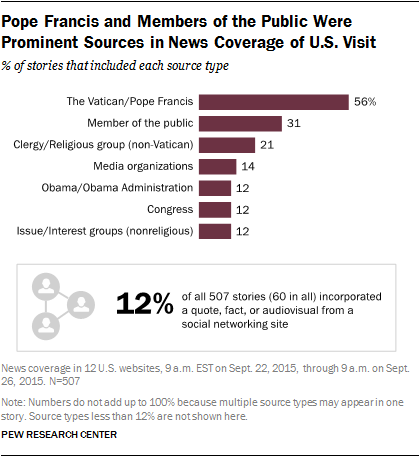 In covering Pope Francis’ September 2015 visit to the U.S., the news media gave strong voice to the hundreds of thousands attending the events, according to a Pew Research Center analysis of news coverage of the first four days of the visit. But if the public helped tell the story of the visit through their smartphones and social media, that conversation occurred largely outside national media accounts. Instead, journalists relied mainly on personal interviews and encounters with the public to help shape their coverage. Across 12 heavily visited U.S. news websites, the top sources cited in stories about the historic trip were Pope Francis himself – or an official Vatican spokesperson – followed by the general public. More than half (56%) of stories produced by these news websites quoted Pope Francis or an official spokesperson; 31% quoted a member of the public. In the four-day stretch that included a public event with President Obama, the first ever papal address to a joint meeting of Congress, and remarks that often touched on politically divisive issues, national politicians were a natural part of the story. But their statements did not dominate the narrative. Members of Congress were cited in 12% of stories, and another 12% included a quote from President Obama or members of the executive branch. Presidential candidates were cited in 5% of the stories. In all, 25% of stories contained at least one of these sources. Another element that stood out was that despite the sea of mobile phones visible at every stop, ostensibly capturing moments ripe for sharing on social media, few social media moments found their way into the journalistic narrative of the visit. Overall, 12% of all 507 stories referenced a quote, fact or audiovisual from a social networking site. Instead, this was a large-scale news event with an abundance of on-site observers, including journalists who could both witness the event themselves and personally connect with others on the scene without needing to use social media as an intermediary. These findings shed light on the dynamics of social media in our news environment. Past research by Pew Research reveals the critical role social media can play in informing the public about certain types of news events: Situations in which few individuals witness a controversial event, such as the police-involved shooting in Ferguson, Missouri; the fog of civil uprising or war, in which journalists do not have access to the scene, such as during the Arab Spring; natural disasters such as the 2013 tornado in Moore, Oklahoma; and traumatic breaking news such as the shooting in Newtown, Connecticut, in 2012. In these kinds of instances, journalists are to a large degree beholden to those on the scene to help tell the story. But in a highly planned and anticipated news event open to massive numbers of the public and the news media, the findings suggest that the social media activity – while still important in bringing people together and passing news and personal sentiments along – was not used to fill in pieces of the story. These are some of the findings from a study exploring the voices heard in the coverage of the papal visit to the U.S., and the degree to which social media served as a source for journalists. The study is not meant to encompass all media coverage of the pope’s visit but to offer a window into how these two dynamics played out in the stories published by some of the most-visited, broad interest news websites in the U.S. Researchers captured news coverage from Sept. 22 (the day the pope arrived in the United States), until the morning of Sept. 26 (the day he left New York City) across 12 websites, pulled from the top 25 sites listed in comScore’s news and information category. In each story, researchers coded the presence of 17 different source types and whether for each social media was referenced. (Stories were included in the study if 50% or more of their content was about the pope’s visit in United States, while those that were entirely a video, audio, slideshow, straight transcript or quiz were excluded.) Within each story, repeated citations of the same source category were coded only once. When the same source type was cited from different platforms, then both cases were captured as one source type from two different platforms, for example: A quote by President Obama that appeared on Twitter and a quote by President Obama in an interview in the same story were both included. The full methodology is available here. Following the pope’s own words were those from the general public. About three-in-ten stories (31%) cited or quoted a bystander, mostly as a witness to or participant in the events. In many cases, the comments from the general public showcased the personal experiences of these individuals. National political figures were also a part of the coverage. Remarks from President Obama and the executive branch and from members of Congress each appeared in 12% of the stories studied. Statements from one of the 2016 presidential candidates appeared in 5%. Taken together, at least one of these national political actors was cited in 25% of the stories. Some instances where a member of Congress was cited added a humanizing element to the story. And while local political leaders and officials such as mayors were referenced in 10% of the stories, much of that related to the logistics of handling the crowds, including security needs, as in a CNN story about NYPD’s preparedness steps. The New York City Police Department’s threat assessment, obtained by CNN, is based on “open source” information and is part of a larger document produced by the police departments in the three cities the Pope will visit in his U.S. tour: Washington, New York City and Philadelphia. Also cited frequently, in 21% of stories, were church leaders and religious officials, both Catholic and not. No other source type was cited in more than two-in-ten stories. For example, factual information and quotes from media organizations, including social media companies, were used as sources in 14% of the stories. In the past couple of years, Pope Francis has generated a social media buzz, being active on Twitter and with more followers than other popular celebrities. In light of his visit, a full set of pontiff-related emojis were created, the White House used Periscope for the first time to broadcast his arrival in Washington, D.C., and event attendees were seen again and again capturing moments on screen. Nevertheless, the news media did not use social media widely in covering his visit. Just 12% of all 507 news stories studied cited a source from a social networking site. A vast majority of these stories (83%) used Twitter. Even though Facebook has by far the largest U.S. user-base of any of the social networking sites (66% of U.S. adults compared with Twitter’s 17%), Facebook’s ‘walled garden’ structure makes it harder for journalists to access and use it as a way of gathering information. When journalists did use social media in their stories, those references came from a broad mix of sources. Most of all, journalists used social media in their stories as a way of drawing on their own tribe. Nearly four-in-ten, (35% or 21 total) stories with social media citations showcased posts from other media outlets. This included other journalists, news organizations or data points and facts provided by one of the social networking sites themselves. For instance, the examples below from the Huffington Post show the use of social media posts published by other media organizations, such as Mashable and the local ABC affiliate in New York City. Nearly three-in-ten stories (28%) that incorporated social media included remarks by members of the public. Some of these posts were embedded in news stories and portrayed the live events surrounding the pope’s visit. A number of these were pictures that bystanders took of themselves and the pope, or statements regarding the pope’s speeches and activities. Members of Congress were a social media source in 12% of the stories, the same portion as President Obama or a member of the executive branch. Another 13% of stories with a social network citation referenced posts or comments from members of the clergy, such as bishops, pastors and cardinals, as well as religious groups, some of which helped organize a number of the events in which the pope participated. Notably absent from the social media references in stories about the visit were Pope Francis and the Vatican. Even though the pope is active on Twitter (@pontifex), he did not post any tweets during his visit to the U.S. The two Vatican-related social media citations that were included in online news stories were an older tweet of his used as an example of his participation on Twitter and an embedded YouTube video of the live broadcast of his visit via the Vatican’s official YouTube channel.